Akai "Michael Jackson Band - Great musicians use great equipment" full page colour advertisement from page 59 in the March 1989 issue of Electronic Musician. Coincidences are great. I started blogging about the Akai MPC60 back in November and had planned to push out this next ad on Friday. And then Akai suddenly announces their latest extension of the MPC line - the Akai Force. Reverb is a nice Pre-NAMM starting point to learn more about it. BBoy Tech Report also has a nice intro on the machine. And, just by coincidence, the BBoy site also has a connection to this advertisement. But more on that in a second. I gotta hand it to Electronic Musician - sometimes they pulled in some great advertising that never made it into Keyboard Magazine. This appears to be one of those ads. And the ad looks to have appeared only once as far as I can tell - in this EM March 1989 issue - making it even rarer. On the left is Ricky Lawson, drummer and Grammy winner, who played and recorded with some of the hottest hit makers including Whitney Houston, Lionel Richie, Eric Clapton, Quincy Jones and Anita Baker. He passed away in December 2013 and there's a nice little write-up on the Modern Drummer Web site. Check out his Wikipedia page it's a who's-who of amazing artists. 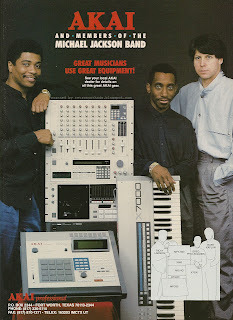 On the right, leaning on the 7000, is keyboardist Greg Phillinganes. His Wikipedia page is as jammed packed as Ricky's with some amazing references including touring and recording with the Bee Gees, Donna Summer, Karen Carpenter, Aretha Franklin, Patti LaBelle, Richard Marx, Paul McCartney, Al Jarreau, Quincy Jones, and Stevie Nicks. And last but not least, on the far right is Rory Kaplan. Google him and one of top links to come up is his LinkIn page, listing his current position as Executive Producer/Artist Relations with Auro Technologies. And looking back at his post-musician career includes four years in the role of Artist Relations with Intel and Microsoft. Rory is in desperate need of a Wikipedia page. Just saying. Now - back to coincidences. One of my favourite parts of researching and writing this blog is when I find connections between advertisements and interviews or other historical events. And this ad has a great connection. "...at the January 1988 NAMM Show in Anaheim, I was approached by three members of Michael Jackson’s band touring for the BAD album. They explained their touring schedule, which basically was one week in each city. They had some free time every week and asked if they could do a clinic in each city for Akai. I couldn’t say “No” to that, since this was the biggest tour on earth at the time. So, every week I flew to a different city and Ricky Lawson, drummer, Greg Philliganes and Rory Kaplan, keyboard players did a clinic. I was the master of ceremonies, and these guys came up with the whole clinic format." We now take YouTube for granted, but I can only imagine how cool it would have been to have attended one of those clinics. More MPC stuff to come!